Jean B. Atkinson was the daughter of Dr. Howard B. and Annie J. Atkinson of 144 Huron St. and grew up in Embro. She received her early education in Embro and then attended Woodstock Collegiate. Jean was a former Officer of the local Red Cross Corps. She graduated from the University of Toronto as a physiotherapist. Active in sports, she was a member of the University girl's hockey team. At the formation of the Women's Division of the Royal Canadian Air Force she resigned her position at the Ontario Hospital in Woodstock and enlisted in the service. She trained at Manning Depot in Toronto and upon graduation was awarded a commission. 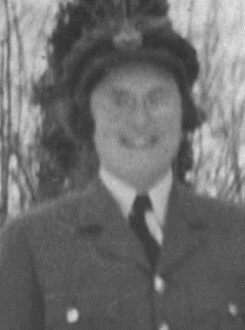 She served at St. Thomas and Rockcliffe (Ottawa) before being posted to Calgary, and later to Regina where she was in charge of the release division of the Women’s Division. On November 23, 1944 she and five others were killed in a plane crash near Calgary. Jean was survived by her parents and two brothers, Dr. Anson Atkinson of Norwood and Private Ray Atkinson, Royal Canadian Army Service Corps, Camp Borden. Her funeral was held in Knox United Church Embro where over 700 attended. She is buried in the family plot in North Embro Cemetery, Ontario, Canada.